How Are Koalas & Kangaroos Different? Kangaroos and koalas are both iconic Australian marsupials. They're also both cute enough to be a popular choice for stuffed animals and cartoon characters. Despite having these things in common, the kangaroo and the koala are very different animals, with differences ranging from size and appearance, habitat and food choices to personality and temperament. Marsupials are an order of mammals that have pouches on their bellies in which they carry their young. Except for the North American opossum and a few obscure South American varieties, marsupials live mainly in Australia and surrounding islands, including Tasmania and New Guinea. In addition to koalas and kangaroos, these marsupials include the wallaby, wombat and Tasmanian devil. Kangaroos are well known in pop culture thanks in large part to depictions in cartoons such as "Looney Tunes" and "Winnie the Poo." They tend to be tall -- the red kangaroo can grow up to 7 feet -- and have powerful back legs with large feet that they use for jumping. They have thick, long tails that they use for balance, and short forearms with hand-like paws for grasping. The koala is sometimes referred to as a koala bear, despite being unrelated to the bear family. This is because of its teddy bear-like appearance. Koalas are small, tree-dwelling animals, about 2 to 2 1/2 feet long, with short gray fur, big round ears and a bulbous nose. They have sharply clawed, finger-like toes on each foot for climbing and grasping. Kangaroos include several subspecies that are widespread throughout Australia, Tasmania and New Guinea. A kangaroo mother will carry her young in her pouch until he outgrows it. They're diurnal animals who travel in herds and spend their days grazing on grass and their nights sleeping on the ground. By contrast, koalas are nocturnal animals who stick mainly to trees and munch on eucalyptus leaves. Koalas carry their young in the pouch until they are about 8 months old, and then continue to carry them on their backs until they're about a year old. 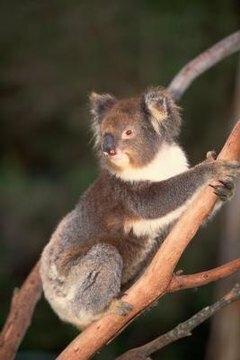 Because of overhunting, as well as disease and deforestation, the formerly abundant koala is now found only in parts of Australia, including Queensland, Victoria and New South Wales. What Are Some Traits That Make a Koala Different From Other Mammals? What Kind of Feet Do Kangaroos Have? What Are Kangaroos Related To? How Long Is a Kangaroo's Life Span? What Type of Habitat Does a Koala Bear Live in?